Made here with Uchiki Kuri and Golden Flaxseed. Update 16 September 2016: They freeze perfectly and taste even better the second day. I feel as if I’m apprenticing at Cooking Without Gluten. I’ve been trying raw apple in multiple recipes recently. A few failures, but a fair few successes. I often think it’s important to credit people even if it’s just a tip, technique or just inspiration. I’m taking the Blended Raw Apple ball and running with it, but I am grateful for the original idea. Funnily this recipe is similar to these rolls whereas they’re actually based on these Buckwheat Scones. I think when you’re working with multiple allergies/intolerances there’s always going to be some overlap and similarities between numerous recipes, especially as the ingredient pool shrinks. As I say these are similar to the rolls, I did get the idea for the raw apple from the same, but this was partly my own tinkerings too. I used flax as is seen in the the flax variation, a trial for a lighter scone, an unsuccessful one, but a decent variation. Get free green apples > What about Apple Scones? > Use flax in case it’s wet > Er, it’s all wet > Rest it! > It’s sticky! > Wet hands and hope > Bake > Okay, let’s see > Oh, how nice! So, it’s partly me knowing a bit about what might happen, hence the flaxseed, a great liquid absorber, and partly luck. As is all baking in some ways. This recipe is oil-free, but not sugar-free. I think it could be diary free, I don’t see the milk making much of an impact. Do tell me if you try it. I will be trying this with vegetable purées in time, hence the title being Purée rather than just apple. I like a very basic, plain recipe first then I go wild with variations and tweaks. So, I’ll get to the taste and texture, but I just want to say as much as I might be making this look flukey, it was based on a fair bit of accumulated knowledge. What I’m saying is don’t be afraid to try various recipes, you never know what you’ll learn. What I’ve managed to do here is threefold, firstly: They’re lighter! Finally. I’ve tried so often to make those dense scones even a fraction lighter. Making a batter instead of a dough obviously helped. Second: No more tears, I mean crumbs, the original recipe can, on occasion, fall apart, and is always crumbly. These cut clean while hot. Lastly: They can be frozen, I’m double checking this and I’ll update the recipe with the info tomorrow, but it’s looking good. I’ve gotten this recipe to where I wanted it. These are dense still, with a firm chew to them, but they have a springy texture too that in a lot of ways reminds me of the scones of my youth. The apple seems a bit more prominent, but that might be due to the sugar. It’s still very mild, so you could use these with any filling or spread without fear of mismatched taste pairings. So, here we are: A lighter scone. Finally. One that doesn’t take too much work to come together. A bit messy, but that’s not too much of a downside. As to what the future holds, well, I imagine a pumpkin purée pumpkin spiced version might be popular. Perhaps a savoury vegetable version too. A diary free option is a given, assuming I remember. The fact that they can probably freeze means no more trying to eat them all at once to avoid them going stale, which means I’m more willing to try something new with them. I’m really pleased with this recipe. There are times when I look at all I avoid using in my baking and think to myself: You’re doing okay. Oreos and scones, not too bad for a couple of days work. Who knows what the future holds, but knowing me it’s going to contain buckwheat. Until the next post. 1. Add Buckwheat Flour, Sugar and Baking Powder to a bowl and set aside. 2. Blend Apple, Egg and Milk in a food processor or blender it becomes pale and foamy. 4. Add the Apple mixture to the dry ingredients and mix using a fork. A soft, thick, slightly sticky Batter will form. Rest for 10 minutes. 5. Pre-heat the oven to 200c (Fan) and line a baking tray with greaseproof paper. Wet hands and scoop up 1/4 Cup of of the dough, it will be soft and somewhat sticky, form into a ball, place onto the tray and press down gently. Repeat until dough is used up, wetting hands each time. Top with the Seeds if using and bake for 12-15 minutes or until Golden Brown, firm to the touch and hollow sounding when bottom is tapped. Transfer to a wire-rack and cool for 10 minutes. 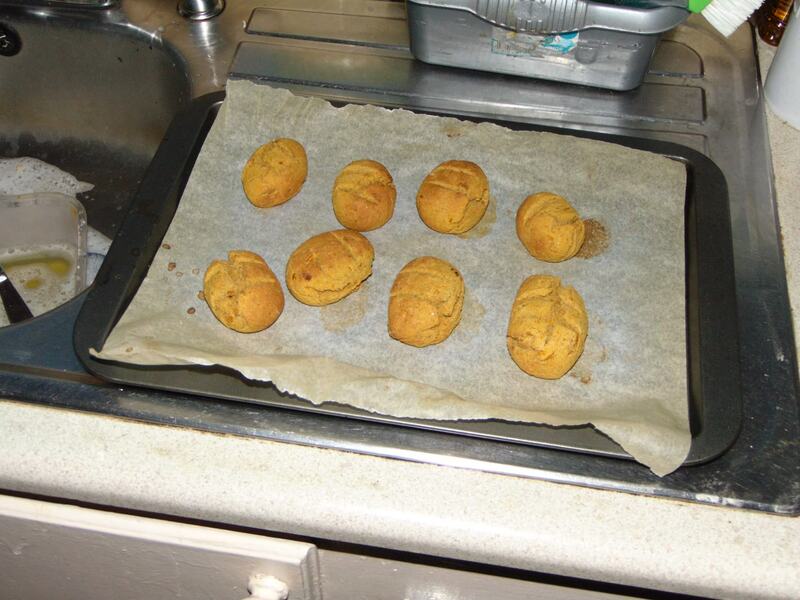 Pumpkin Scones: Replace Apple with same weight in Steamed Cubed Pumpkin or any Orange Fleshed Squash. Replace Sugar with Coconut Sugar. Add 1 Tsp Pumpkin Spice alongside Flour. Dough will be thicker and more easily handled. You are so good! I never thought that it would be possible to bake buns with buckwheat flour. I am all now in fresh cauliflower experiments, the batter with buckwheat flour was thicker compared to apple, but with just water added worked well, even when the whole process was made in food processor. The bread is simply addictive, the texture exactly as you describe, dense enough, but light with pleasant chewiness. It 2 days I baked it 3 times. Are we going to be bold and try carrot next? Your recipes with cauliflower look amazing. I really felt inspired by them. I’ve become completely enamoured with buckwheat flour, there’s a versatility hidden within that simple seed that seems endless. Carrot sounds wonderful. I also hope to have some squash next time, some Golden Nugget might give it a lovely golden hue. I think there’s nothing so exciting as a recipe with so many possibilities. Good morning! I really like your idea of using one flour only. I have started to forego the gum in some recipes but am still shy about not using starch (tapioca starch in particular seems to make breads chewier). Wet batter is often the key to successful GF breads, you are right in stressing it. Apple flavor too strong? Have you tried using pear instead? I now use pear purée rather than apple purée when making crepes. I will be trying your recipe and will let you know. It is scary, especially when the batter can be extremely thin. In my quinoa flour bread recipe the batter is almost as thin as water, but it bakes into a lovely light bread. Experimentation and learning from failure is key in all of this. Pear sounds interesting, sadly I can’t tolerate pears due to their sorbitol content. I hope you’ll enjoy it and I look forward to hearing from you.